I've tried a couple of small hugelkulturs with good results but just with sticks. Now I'm looking at a big one with a lot of wood, much of it tree trunk sized in a hay field. I know that a thick enough layer packed closely will kill the hay. However, many sites recommend making the hugelkultur seven feet high initially so that it is "self-watering". Our field is next to a pond and is already pretty wet so I don't know that I need that feature. Then I saw a site that simply recommended using trunk material on the edges to make a raised bed then planting in the center. This appeals to me greatly except I would like to fill it with sticks, smaller branches and a boatload of used straw and goat manure, keeping in mind that I need to kill the hay so I need full coverage. Basically make it a huge composting bin. Would that make sense? Any thoughts or tips? I have never heard of them before and had to google it. They are pretty neat looking. Most of the ones I see look like the photos below. What are you planning to grow on it? I had to look it up also, I thought you were planning worm farms. 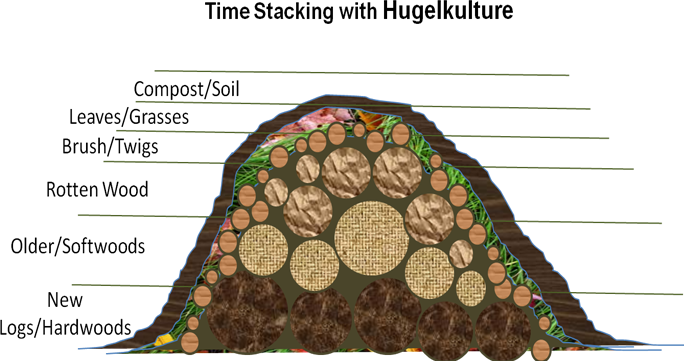 Not very neat in that pic but basically just using the large tree trunk material on the outer edges and filling in the center with sticks then piling in soil, rotting leaves etc. It will rot faster and wouldn't need to become such a landscape feature. I'm trying to get rid of a lot of rotting wood and kill the hay field at the same time in a productive way. There seem to be a lot of different kinds of hugelkulturs. I keep a running worm farm in a giant Rubbermaid container. I use it to "seed" areas with a starter worm population. Works beautifully.